Norway’s biggest bank thinks the Norwegian economy has bottomed out for now, predicting some new growth ahead, less reliance on oil prices and a strengthening currency. Oil prices have been rising, too, and that’s always economically good for an oil-producing nation like Norway. DNB Markets, which issued its half-year report on economic prospects for Norway and the rest of the world on Wednesday, thinks the krone will keep getting stronger. “The krone has been weaker than what the outlook for the Norwegian economy suggests,” Magne Østnor, currency analyst at DNB Markets, told Dagens Næringsliv (DN). By this time next year, DNB Markets thinks a US dollar will cost NOK 7.57, down from NOK 8.22 on Wednesday. 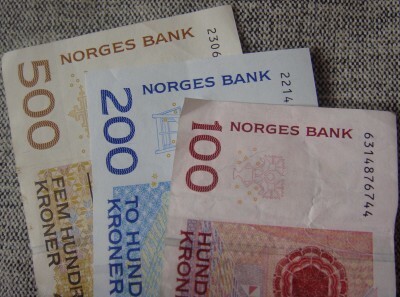 A euro will cost NOK 8.70 (NOK 9.21 today),, predicts DNB, while the already-weaker British pound will cost just NOK 9.67, down from NOK 10.69 on Wednesday and way down from recent levels over NOK 13. “We have long had visions of a stronger krone,” Østnor said. A sudden strengthening over the past week has sent Norwegians streaming over the border to go shopping in Sweden, where prices are cheaper and the Swedish krone is weaker against Norway’s currency than it has been for months. Now DNB Markets is predicting a “considerable” strengthening of the krone in the months ahead, reports DN. “The bricks are falling into place for the krone,” Østnor said. It has traditionally risen along with rising oil prices, which are up 15 percent over the past two weeks. Norway is also selling more oil than it was a year ago, according to state statistics bureau SSB (Statistics Norway). New figures from SSB show that exports of Norway’s North Sea crude oil rose by 6.7 million barrels last month, compared to July of last year. That’s an increase of 17.6 percent, while a lower oil price last month meant that the value of the exports was down 1.8 percent. Newspaper Aftenposten reported Wednesday that the OPEC cartel may resume talks on freezing oil production, which would send prices up higher. DNB Markets has already reported that it thinks oil prices will rise to around USD 55 a barrel during the fourth quarter of this year and to USD 70 a barrel by the end of next year. There’s been a weaker decline in oil investments, for example, and an increase in real estate invesment. It’s “nothing major,” noted Jeanette Strøm Fjære, a macroeconomist at DNB Markets, “but among the factors that contribute to a bit higher growth.” Hiring activity remains low and there’s been a decline in real pay growth, because of higher inflation, but the overall picture is better. DNB Markets also thinks interest rates have bottomed out at their current record-low level of 0.25 percent for the central bank’s key policy rate. Prices are also rising more than expected, making it less likely the central bank’s board will lower rates again, taking them down to zero.